In 2012, Richard J. Davidson, Ph.D. with Sharon Begley, published The Emotional Life of Your Brain. Davidson is a professor of psychology and psychiatry at the University of Wisconsin-Madison. “The Emotional Life of Your Brain” explores how the unique patterns of our brain affect the ways in which we think, feel and live – and how we can change these ways. Six dimensions of the so-called “Emotional Style” form the core of “The Emotional Life of Your Brain”. Davidson describes an “Emotional Style” as “a consistent way of responding the experiences of our lives”. He makes the point that these responses are governed by specific, identifiable brain circuits and which can be measured as such. In other words, each person has an overall Emotional Style which is comprised of six different dimensions. These dimensions can influence the occurrence of feeling certain emotional states and ways in which we respond to life events. Resilience – How do you usually respond to setbacks or meltdowns? Do you carry on despite the setback or do you give up and surrender? People at one extreme of the “Resilience” dimension are Fast to Recover from adversity; those at the other extreme are Slow to Recover, crippled by adversity. Outlook – The “Outlook” dimension refers to one’s emotional disposition. Do you manage to maintain a positive outlook on life or do you tend to be more cynical and pessimistic, struggling to see any positives? People at one extreme of the Outlook dimension can be described as Positive types whilst those at the other extreme can be described as Negative types. Social Intuition – The ability to pick up on other people’s mental and emotional states is key to the “Social Intuition” dimension. Can you read people’s body language? Are you able to pick up on the signals that people give off, indicating for example that they are stressed or bored? Those at one extreme on the Social Intuition spectrum are Socially Intuitive types. Those at the other end of the spectrum are the Puzzled types. Self-Awareness – Are you aware of your own thoughts and feelings and attuned to the messages that your body sends you? Or do you act or respond without really knowing why? At one extreme of the “Self-Awareness” dimension are the people who are Self-Aware and at the other end the people that are Self-Opaque. Sensitivity to Context – The Sensitivity to Context dimension is all about being sensitive to a specific situation or context, understanding which behaviour is appropriate and which is not. Are you able to pick up on conventional rules of interaction or are you surprised when people tell you that your behaviour is inappropriate? People at one end of the Sensitivity to Context spectrum are Tuned In and those at the other end are Tuned Out. Attention – How sharp and clear is your focus? The “Attention” style hones in on people’s ability to stay focused and ignore any distractions. Are you so caught up in what you are doing that you do not notice anything that is happening around you? Or do you tend to flit between thoughts or emotions, unable to hold on to anything long enough? At one end of the Attention spectrum are people with a Focused style; at the other, those who are Unfocused. In subsequent chapters of “The Emotional Life of Your Brain”, Davidson explores areas such as assessing your own Emotional Style and how your style – and its underlying dimensions – develop. The book’s chapters on “Assessing Your Emotional Style” and “The Brain Basis of Emotional Style” form in my opinion the heart of Davidson’s findings on Emotional Style. In the chapter on “Assessing Your Emotional Style”, the book provides readers with ways to assess the different dimensions that form their Emotional Style. Davidson provides specific statements and scenarios to enable readers to find out where they sit on the spectrum of the different dimensions (see sample statements and scenarios in Fig. 1 below). He also provides more context around the various dimensions, explaining their role and significance in relation to one’s emotional responses. One of the main points that Davidson makes in relation to the dimensions of the Emotional Style is that each dimension reflects activity in specific, identifiable brain circuits. Each dimension has two extremes. For example, the Outlook dimension has a Positive and Negative extreme (see the “Outlook” dimension above). These extremes are usually the result of heightened or reduced activity in the relevant brain circuits. In the chapter on “The Brain Basis of Emotional Style”, the book delves into the specific parts of the brain that ‘power’ each dimension. 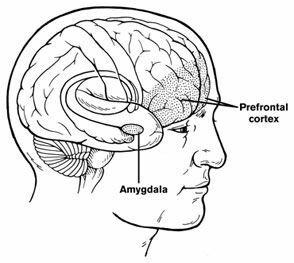 For example, the left prefrontal cortex and amygdala allow the brain to bounce back from an upsetting experience, thus enabling people to be resilient (see the “Resilience” dimension above). The book contains numerous pictures of relevant brain circuits (see Fig. 2 for a sample illustration of the workings of the Resilient Brain) and explores in subsequent chapters what can be done to influence the activity in these brain circuits. Main learning point: The Emotional Life of Your Brain is a fascinating book and a good read for anyone interested in understanding more about the inner workings of our brains and how we respond emotionally in certain situations. The Resilience dimension is very much about how quickly or slowly people recover from setbacks. The capacity to remain upbeat and to sustain positive emotion over time is the key measure of the Outlook dimension of your Emotional Style. When evaluating a coworker, I focus on details about which areas he needs to improve rather than on his positive overall performance. I believe the next ten years will be better for me than the last ten. This dimension of the Emotional Style looks at the extent to which a person’s social intuition is developed; how attuned are they to nonverbal cues from other people? I often find myself noting facial expressions and body language. I find it uncomfortable when someone I barely know looks directly into my eyes during a conversation. Self-Awareness is all about being in touch with one’s feelings and thoughts. Some people have a hard time “feeling” their feelings whilst others are acutely conscious of their thoughts and feelings. I am strongly oriented to the external world and rarely take note of what’s happening in my body. I am usually sure enough about how I am feeling that I can put my emotions into words. Sensitivity to the rules of social engagement and the capacity to regulate our emotions and behaviour accordingly varies enormously among people. I have frequently been reminded when in public to avoid mentioning the names of people who might be around. When I am in a public setting like a restaurant, I am especially aware of modulating how loudly I speak. The Attention dimension is about one’s ability to focus, explaining how focused people can concentrate despite emotion-laden intrusions, whilst the unfocused cannot. I can concentrate in a noisy environment. My attention tends to get captured by stimuli and events in the environment, and it is difficult for me to disengage once it happens.